This is a hot topic in the tech industry at the moment as we have Twitter’s impending initial public offering (IPO) on the New York Stock Exchange (NYSE) on Thursday 7th this week. The thing that has fascinated me most about the mainstream media and wider public’s fascination with Twitter is the mysterious and novelty aspect to their platform when viewing it as a business. Twitter unlike Facebook and even some of the other big name tech IPOs of LinkedIn, Groupon, Zipcar, Pandora & Zynga of recent times is still a mystery to the vast majority of people as to what it is even for. With about 250M active users globally it certainly is not a niche player and has engagement levels and brand recognition that some of the other companies could only dream of. However even if the average user does not use the other brands they can invizage them as a business. They know LinkedIn makes money by companies placing job ads, Zipcar lets you rent a car by the hour and that Groupon sells Daily Deals (although declining part of their offering). They even aware that Facebook sells ads because most people include 2/3 of the US are active users even if they don’t click on them. However with Twitter as a US company, listing on the NYSE and only having 23% of its active user base in the domestic market that only represents about 45M people vs. the over 200M on Facebook. Again not a small or even statistically insignificant number by any means but certainly nowhere near saturation. This combined with the fact the average person often has an experience when signing up to Twitter of not knowing what to do adds this level of mystery to the whole technology. In fact from a mass media perspective, the wider populace tends to hear about Twitter when a celebrity, athlete or politician says something stupid on there. Hence the novelty perception of Twitter and thus an overall a lack of understanding how a system that allows you to only blurt out thoughts in 140 characters for free could ever be a business. This post isn’t meant to be about the best and worst of Twitter, as the fact is it is making hundreds of millions of dollars currently, although it is not showing a profit but is about to list publicly which is a magnificent effort for any company. However using them as an example this illustrates one of the possible major milestone goals of any company. I have been lucky enough in my short professional experience of a little over 10 years to be a part of 3 exits to differing degrees of success. The thing I have learned about going through each of these experiences is the end is never how you imagine it to be and the feelings you experience range from surreal to loss to euphoria and everything in between. There is a 0.00006% chance that your company will become a Billion dollar company and the median time it takes to achieve this is 49 months or a little over 4 years. This is actually unbelievably fast by historical standards as behemoths like GE, Newscorp and McDonalds took decades to achieve this. In practical terms 1 of every 16,667 startups get to this level. There is currently about 74,000 startups on Angel List, a site which most features early stage companies (largely in the technology sector but across many verticals like education, health, retail, etc.) which means about 4.5 of those might get to 1B stage. Remember these companies include some of the biggest new brands, with successful founders, great products and major financial backers like Kleiner Perkins and Sequoia. On AngelList are companies like Pinterest and Uber which are already valued at Billion dollar level in private markets. That is a lot less that probably what a lot of these very smart founders could make with virtually no risk at most companies and the opportunity cost becomes even greater when founders often take little to no salary in early times and fund the company with their own money. I know what that is like as virtually for the first year of the company I founded together with a friend at the end of College we virtually took no income for the first 12 months. The opportunity cost becomes greater when you see the people around you beginning their careers and becoming successful while we were struggling along. At this point you might ask if you have never been a founder why you would start a company at all as even most success looks like not that great a reward relative to the alternatives. Well you might ask yourself why anyone would choose to go down that road. Before I answer this, think if you know or know of any company founders and then think if their CV includes starting multiple companies or always ready to try out a new idea. Well for sure financial riches is a major incentive for anyone founding a company (including myself). However as we established there are other safer routes to get there although at top end maybe not quite so quickly or easily. The best answer I think lies somewhere between the concepts of freedom, taking on a challenge and ego combined with the financial incentive of being that 1 in 16,667. However there is one other outcome I mentioned for a start-up and that is failure. The pitfalls of failure to the human pysche be it traders jumping out of buildings during the Great Depression to Japanese executives doing the same thing in the 80s and 90s and even the more recent tragedy of Jody Sherman and his Las Vegas start Ecomom. However these are as much the outliers as the Facebook 100B exit or what Twitter is about to experience. The majority of people, including me, gain the most invaluable thing of all from our ventures failing in wisdom. That wisdom is the fuel that makes us better people and ultimately successful in the long run. The immediate success is the rarity and the usual story of success involves multiple failures like Michael Jordan being cut from his High School basketball team, John Grisham’s 28 publisher rejections, Thomas Edison’s thousands of lightbulb prototype failures and Abraham Lincoln’s repeated failures in running for office. So maybe the real reason why founders keep doing it is that the 67% chance of total financial failure is not failure at all but an investment in a future success….. 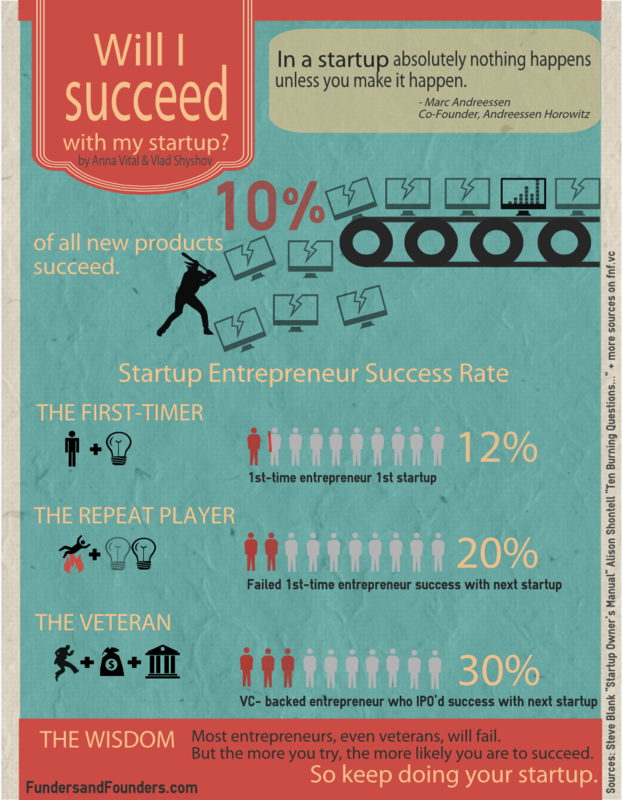 This entry was posted in Tech & Entrepreneurship and tagged failure, fundraising, ipo, selling company, twitter. Bookmark the permalink.